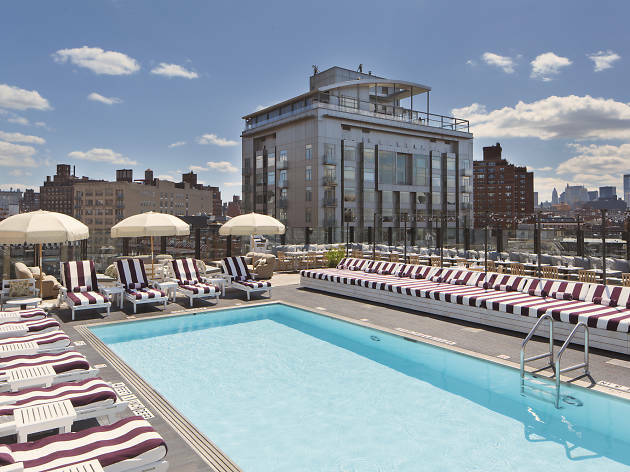 New York doesn’t exactly have a reputation as the most relaxing place, but these luxurious NYC hotels with Jacuzzis might just change that. 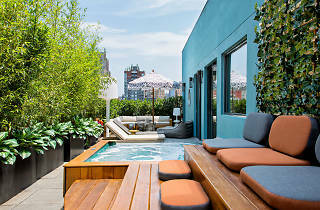 A soak in a hot tub can go a long way, especially after a hectic day of traveling or tramping all over the city on one of the best walking tours in NYC. 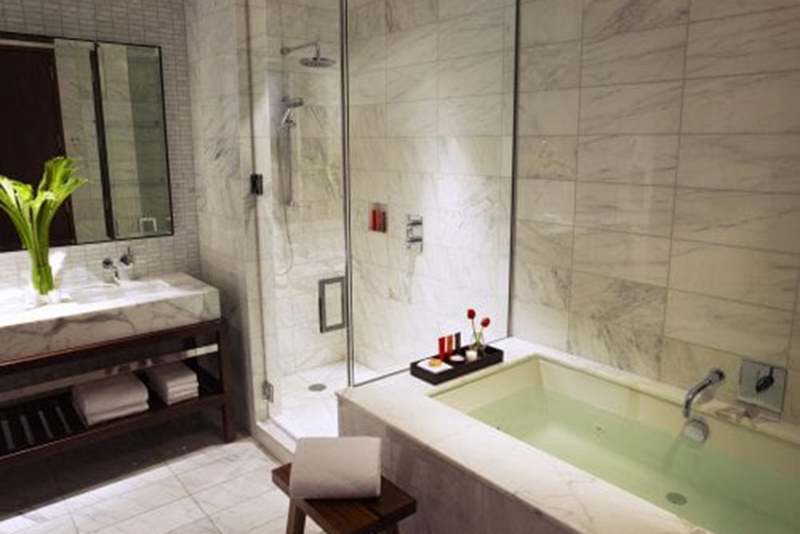 These high-end hotels get it: Each offers Jacuzzis in-room or alongside rooftop pools. 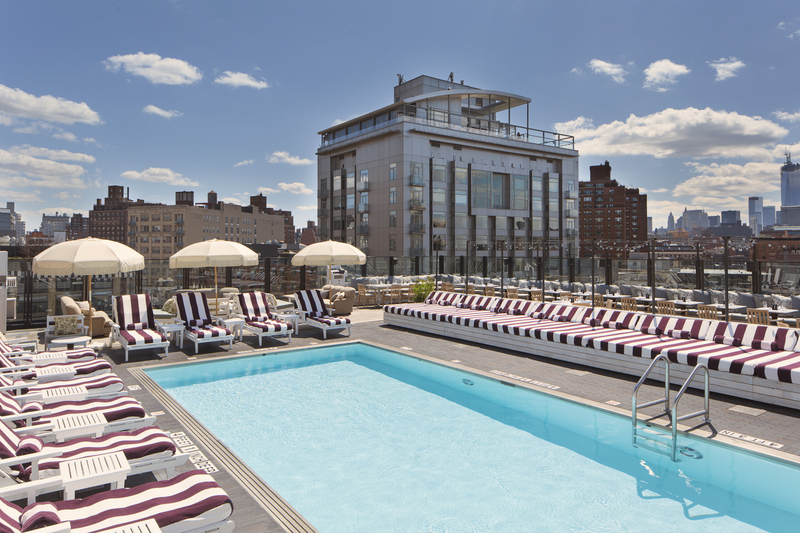 Whether you’re just looking for hotels for a staycation or you're visiting NYC for the first time, check into these properties that rival the best spas and get ready for a nice dip. We’re feeling more relaxed already. Couples, take note: This restored 19th-century townhouse on the Upper West Side provides a special romantic setting with an exclusive Spa Suite. 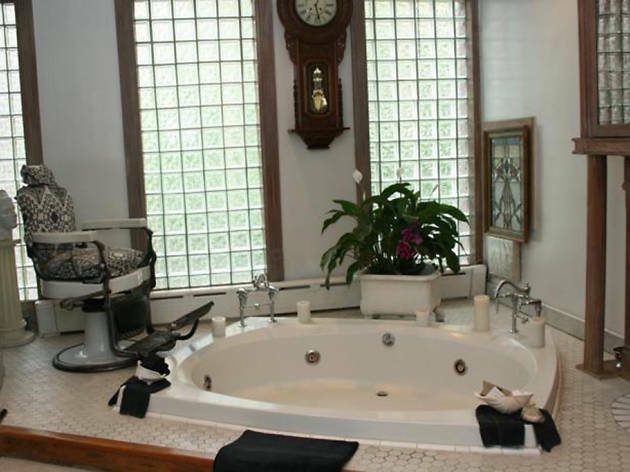 Soak in the two-person Jacuzzi directly across from a fireplace, then kick back on an antique upholstered chaise lounge. To further enhance the mood, this floor’s luxurious bedroom contains a king-sized bed on a raised oak platform. A well-equipped galley kitchen with a granite countertop and bar is paired with an intimate dining area, making for quite the romantic getaway. Having undergone a $1 million makeover by Josh Held designs in 2015, the GuestHouse at Dream Downtown has the lavish addition of a glass-bottom Jacuzzi that’s accessible year-round (an enclosure is placed over the terrace during winter months). Along with this relaxing perk, the two-story, 2,500-square-foot duplex penthouse suite is adorned with a private garden terrace, fireplace, walk-in closet, champagne bar, a Savant home automation system and exclusive guest services ranging from a private barista to a sneaker stylist. Yes, really. 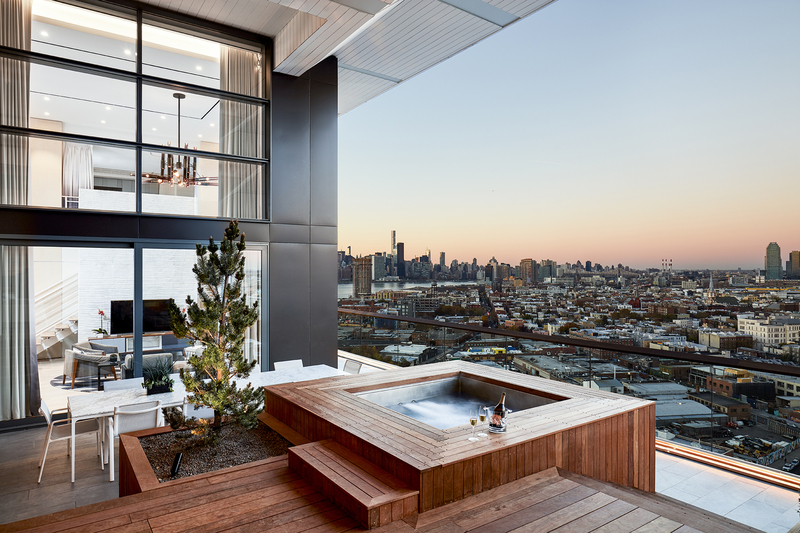 This opulent Williamsburg hotel opened in 2016 to rave reviews, thanks in part to its modern architecture, rooftop pool and dynamite views of the Manhattan skyline. Guests looking for an even more upscale experience should consider renting out the Vale Garden Residence, the hotel’s largest suite. The 1,320-square-foot indoor space is certainly gorgeous—hardwood floors and contemporary art stretch as far as the eye can see—but the spacious outdoor deck with an open-air Jacuzzi is the biggest draw. 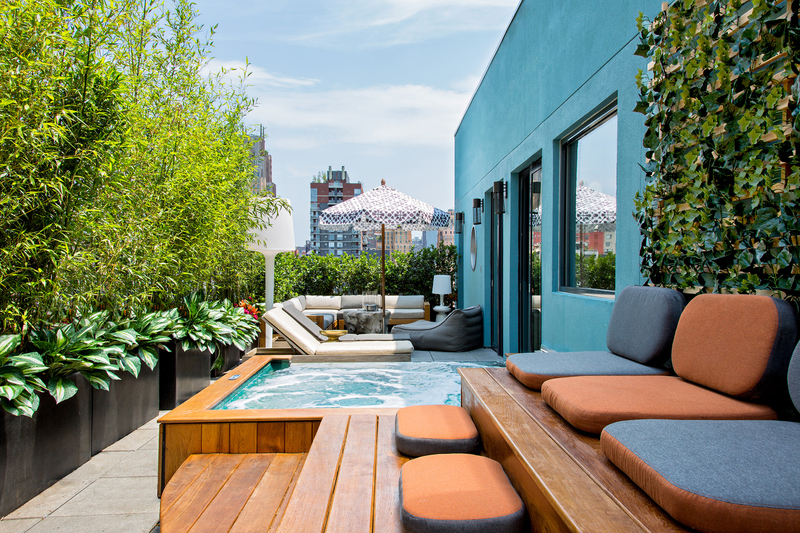 This luxury hotel in Midtown goes straight to the top—particularly with a rooftop terrace Jacuzzi that can accommodate up to five guests or residential tenants. Also on this block-long outdoor level, its garden terrace overlooks the city’s West Side and the Hudson River. Down on its lower floors, this sleek property contains various serviced apartments ranging from studios to penthouse rentals and room selections extending to their Marquis King, Broadway Double, Hepburn Suite and Marilyn Suite. 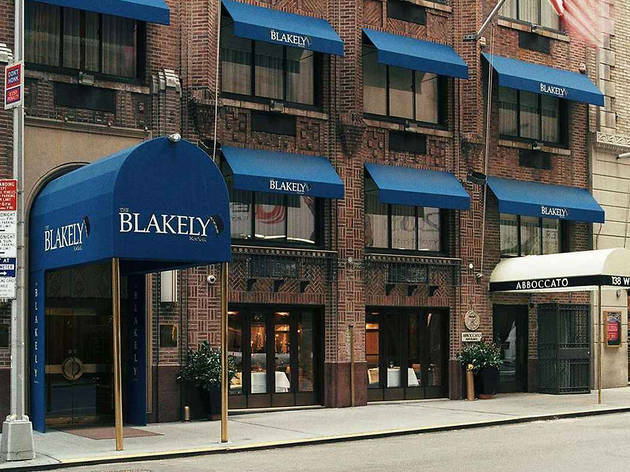 The hotel also holds a 1,000-square-foot fitness center and is a five-minute walk to Times Square—but not close enough to be engulfed in the tourist frenzy. 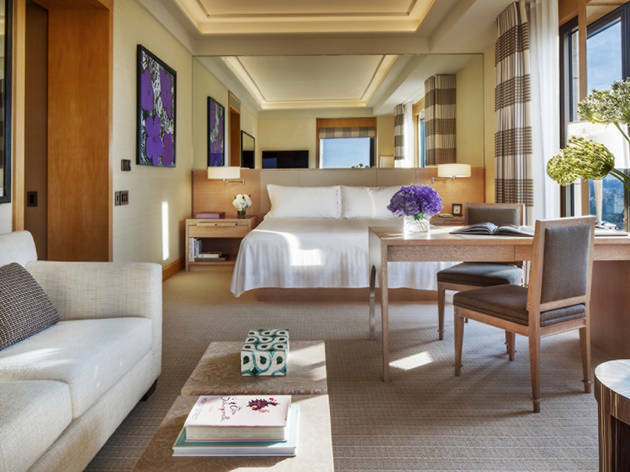 With a palatial Art Deco lobby, sky-high lofted ceilings and marble floors, the Four Seasons is synonymous with splendor. 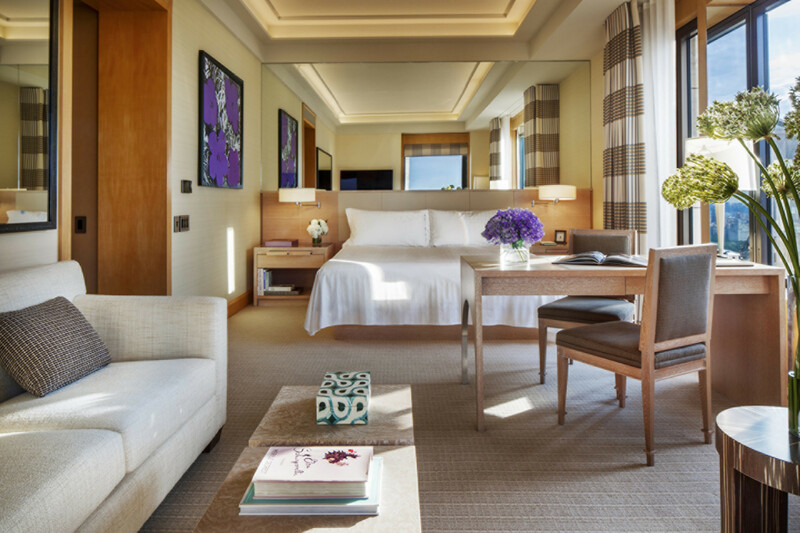 Every room here feels luxurious, but the Manhattan Suite really takes the experience to the next level. The 1,100-square-foot (that’s bigger than some New York City apartments) features a custom-made king-size pedestal bed, Artemide chandelier, ziggurat ceilings and an Italian marble bathroom with a deep Jacuzzi tub. Want privacy while you soak? 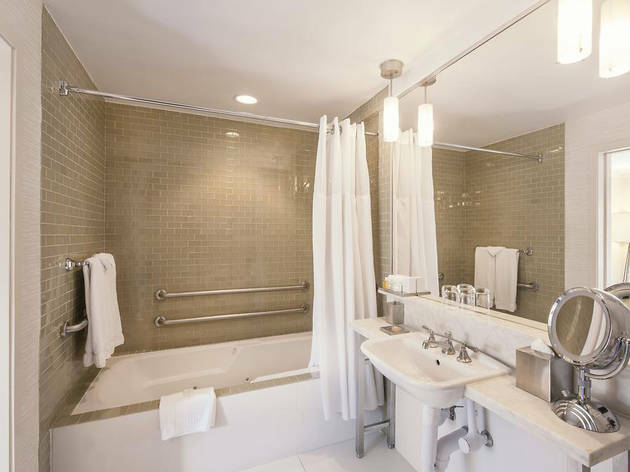 Near Bryant Park, this small luxury property sets the stage for a replenishing stay with nine suites containing five-foot Kohler Jacuzzi tubs and stellar views of 44th Street. 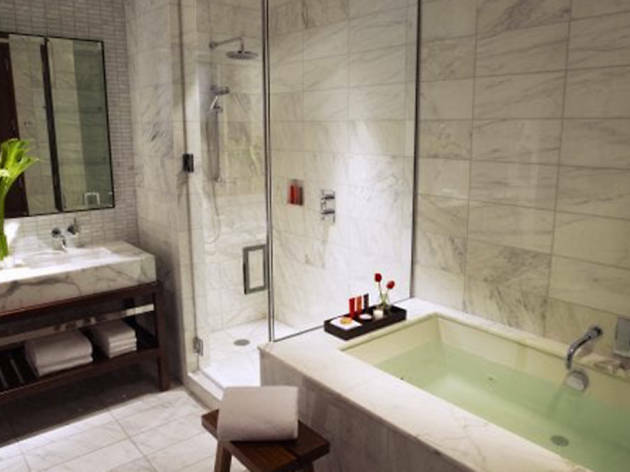 Additionally, each lavish suite is appointed with Italian marble bathrooms, Frette towels and robes and C.O. 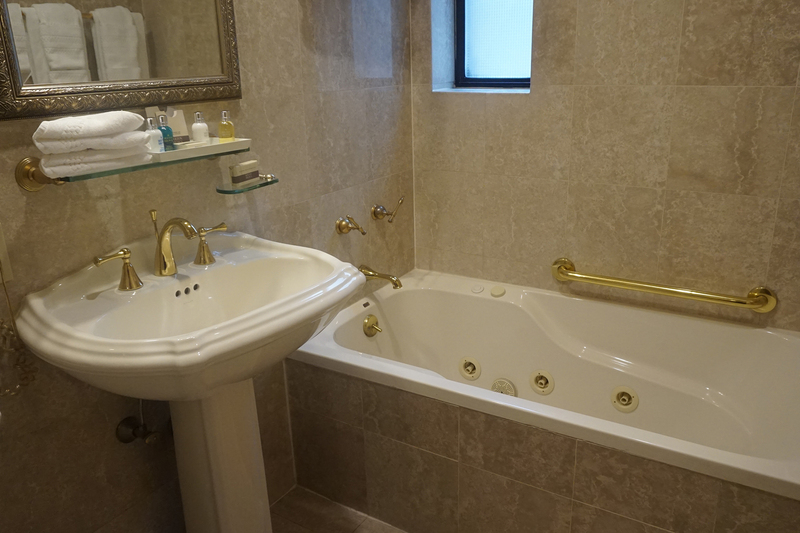 Bigelow bath products, Bose radios with iPod docks and multiple HD TVs. 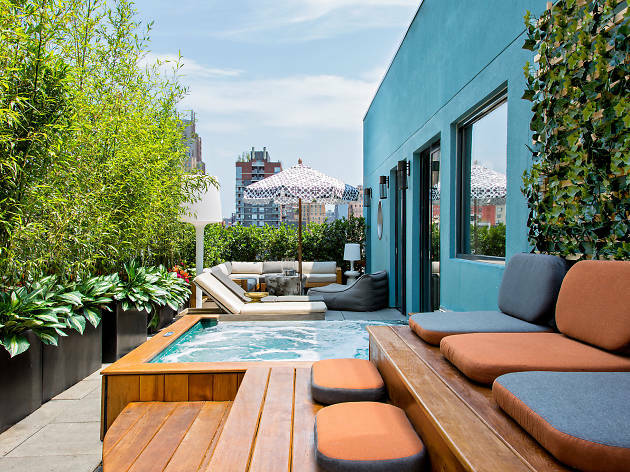 For an effervescent in-room experience, this vibrant property in Chelsea features Jacuzzi tubs in two of its residential suites. 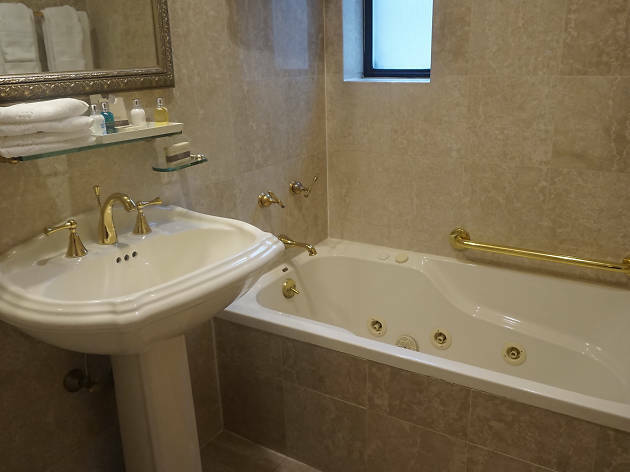 First, its 1,000-square-foot Veranda Suite holds a twin-sink bathroom with a Jacuzzi, a king-sized bed, a living room with a separate furnished sitting area, a workspace with a half bathroom and a large private terrace. Then, there’s the 1,400-square-foot Eventi Suite with a Jacuzzi tub, a living and dining room with a table that can seat eight guests and a separate entertainment area. Oh yeah, and that’s also adjacent to a 3,000-square-foot veranda. 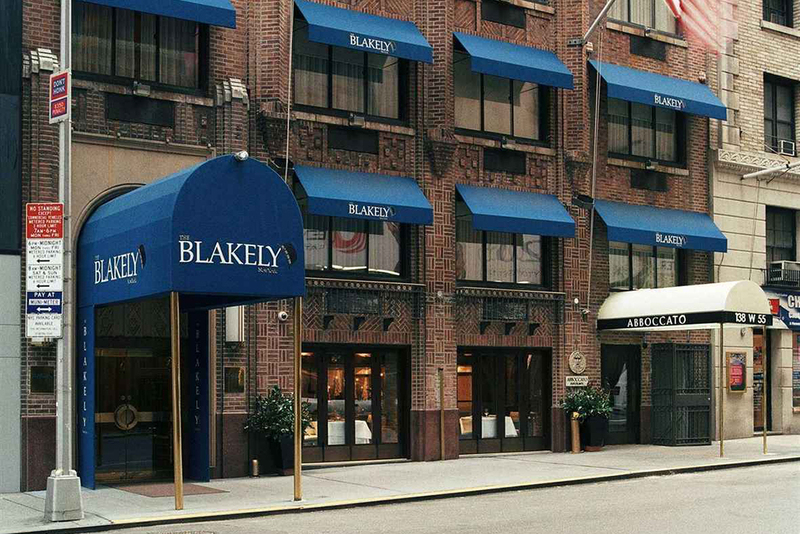 Located two blocks from Carnegie Hall, this hotel gets quite whirly with various one-bedroom suites possessing whirlpool baths. Ideal for families and business road warriors, these 525-square-foot rooms also contain separate bedroom and living room areas with dark hardwood floors, an oversized couch daybed and a second flat-screen television. The decor is reminiscent of a classic English library, with cherry furnishings, ornate trim and oak baseboards. 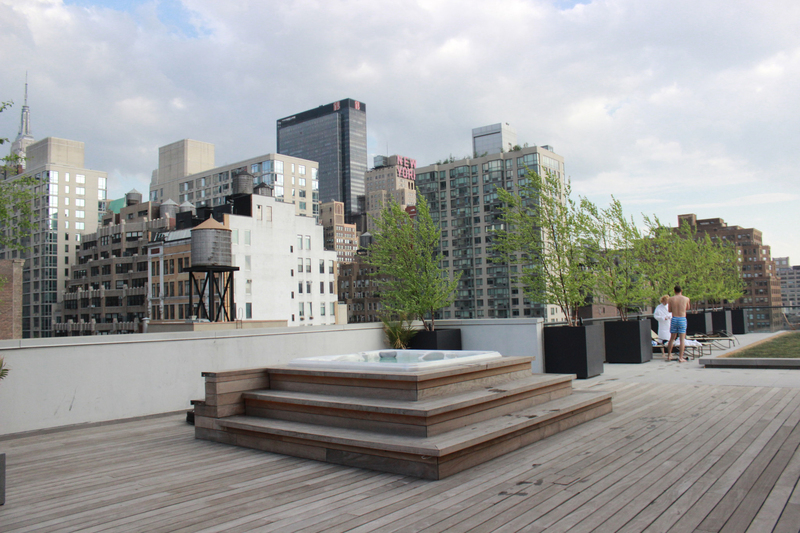 For an even more luxurious stay, book the top-floor penthouse to take advantage of the outdoor terrace. Best known for its streamlined modern “cabins,” Yotel doesn’t have quite the same ritzy feel as some of the other properties on this list. Still, the futuristic hotel still offers plenty of luxury. 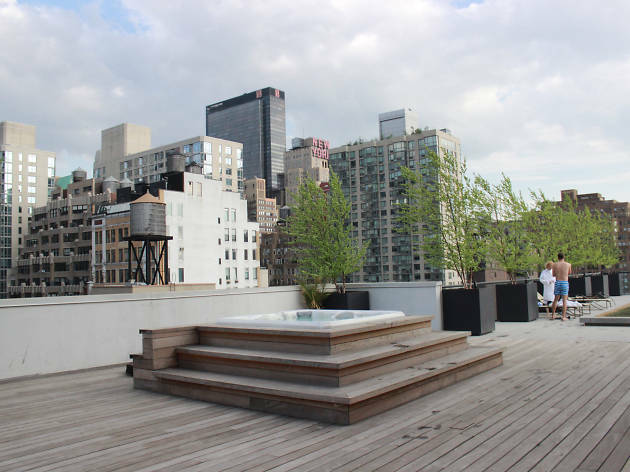 Take the suites, for example: Both the First King Terrace Suites and VIP Terrace Suites include outdoor hot tubs with views of Midtown. Just a few blocks north of the Empire State Building, this Iberostar hotel would make an ideal choice for tourists who don’t want to brave the madness of Times Square. A stately stone facade gives way to contemporary interior design: Pops of color and modern artwork decorate the hotel’s lobby and rooms. 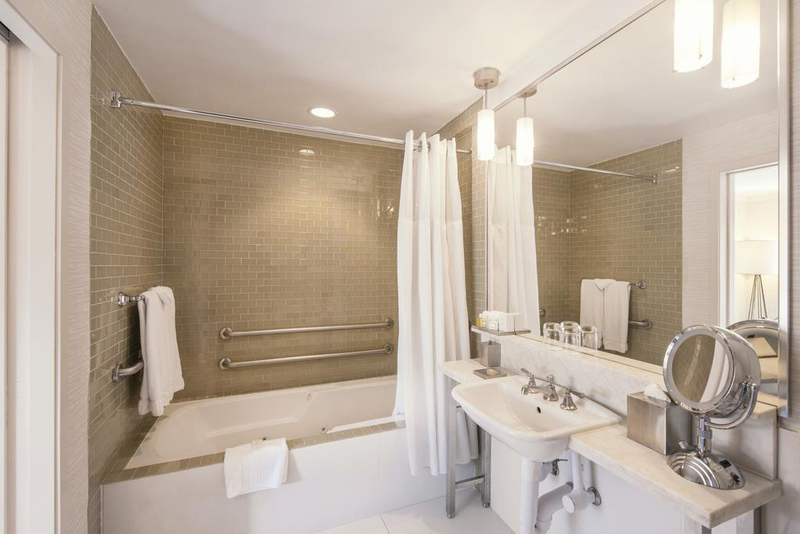 Reserve the Premier Park Avenue rooms to take advantage of the in-room Jacuzzi tubs. Looking for hotels with pools?